There is always something magical about colorful fruit to bringing some new life into the classic, retro slot machine design. If you start to think that retro gaming has nothing new to offer its players, then you are hugely mistaken. As a matter of fact, there remains a huge room for innovation whilst still keeping with the entire old school- retro styled slot scene, which happens to be experiencing a revival presently. Your favorite slot game with magic fruit from Wazdan is a free online casino slot, which is now available in a mobile version! You just need to Spin the reels, catch some juicy, delicious, magic fruit and win great prizes anyplace, anytime! That’s the fun of this free, online, UK based casino. 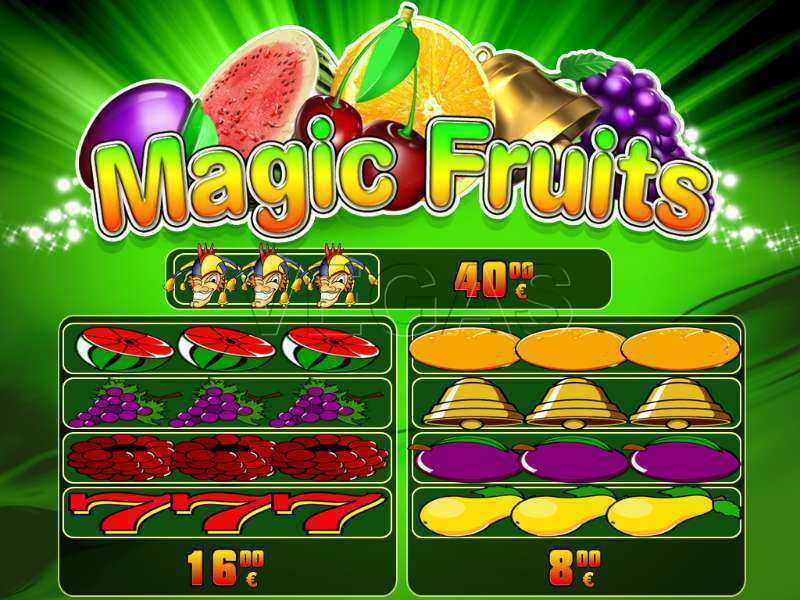 Magic Fruits Slots is one such game found on a matrix that heralds a progressive bonus and jackpot and a simplistic beauty that makes an ideal choice. Magic Fruits Online is a classic 3-reel, 5- a pay line slot that not only offers you with generous payouts but also guarantees a lot of fun, magic, and entertainment! This game brings a lot of bright and high-quality graphics and functions smoothly on all mobile devices. The reels are full of fresh and juicy fruits, such as pears, plums, oranges, raspberries, grapes, and watermelons, as well as bells, red sevens, and jokers, along with the backdrop of a bright green background. Magic Fruit slots will entertain you best during a coffee break at work, on your way home when sitting on a bus, tram or underground, or while waiting in a queue for a doctor’s appointment. Forbidden fruit is the sweetest one, so give this slot a go, catch some delicious fruit and win big money! These magic fruits might seem pretty ordinary and household foods, but they are actually quite tricky to pin down, which makes getting a winning combo all the more tricky despite the small parameters in which this title operates. There are Nine symbols waiting for you, with nearly every one of them being a different variety of fruit, basking in health and glory: pears, raspberries, blueberry, grapes, watermelons, and orange. Then comes a red-headed joker, a bell and a number 7 thrown in to bring about the classic retro atmosphere. One thing that isn’t old school or retro is its lively and carnival-like music, which although being totally random, helps you to rejuvenate, think straight and keeps you prepared for the unexpected. Even though the fruit is meant to be magical, it is, in fact, the joker who brings in the most money, and when we say most, we are only referring to a small amount 4.00 credits, which is a minute. If you are wondering if the payout could get lower than this, you have mistaken again. You will get 0.80 from several icons when three matching tiles are found in this no download slot game. What makes this title even flatter is the lack of special features and bonuses – there is none at all. Zip. Zilch. It all seems very classy, retro and authentic to the machines seen in real casinos, but then a lot of players like to play online due to the variety and extras you receive. The play free Magic Fruits casino slot machine is particularly famous for offering its players free bonus rounds when you strike certain fruit combinations. It essentially might not be a jackpot reel combination, but you could still surprise yourself with one or more free bonus online rounds. Yes, even when you aren’t playing with real money. There happen to be only 5 pay lines available in this slot, positioned top, middle, bottom and diagonal, and the users won’t be given the chance to change how many are involved in a single playthrough, and that will indelibly impact on how much money is being bet in total. Since you’ll be playing with 5,000, it seems a bit annoying that the maximum you can bet is 1,000 credits on every pay line. And when you look at how hit and miss the jackpot is, it’s rather unlikely that you will out down so much money. However, on the other side, it’s great being able to get so involved with this free online casino slot, seeing that many contain such limited betting ranges. More reserved players have a starting point of 1.00, which is indeed a lot of money to ask for a fruit. On the whole, the game is interesting, entertaining and instructive and worth a shot. 0 responses to "Magic Fruits Slot"